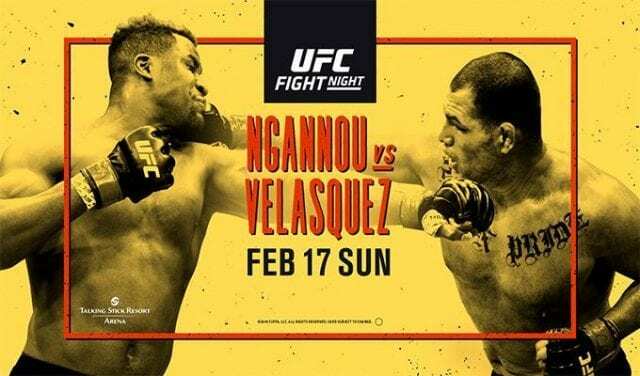 Former heavyweight champion Cain Velasquez will return against Francis Ngannou in the main event of this weekend’s (Sun., February 17, 2018) UFC on ESPN 1 from the Talking Stick Resort Arena in Phoenix, Arizona. The bout is an anticipated one in that it may decide the next contender for the UFC heavyweight title. But that could be stretch considering Velasquez is champion Daniel Cormier’s good friend and teammate. Even if Ngannou won and was potentially in line for the shot, it’s fully possible Cormier faces Stipe Miocic or Brock Lesnar instead. That’s all for the UFC to sort out after the fight, however. For now, the focus is on Velasquez’ return in the city where he wrestled at Arizona State in college. Like last weekend’s UFC 234, the card is a top-heavy one without much undercard depth due to the UFC’s nonstop early 2019 schedule.